Though he works in a technical field, he counts storytelling among his favorite activities. Nathaniel's storytelling career took flight with the births of his children. His children enjoy all kinds of stories, but most of Nathaniel's stories for them involve zany adventures and confrontations with wacky bullies. Nathaniel's first novel, Yaakov the Pirate Hunter, was inspired by his son's request for a story about robots. It combines elements of science, adventure, and Nathaniel's beloved Jewish tradition. As the Peretz Family Adventures Series continues, Nathaniel's children continue to serve as a source of inspiration. 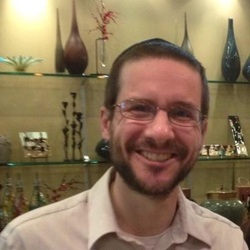 In addition to writing, the author also enjoys studying his Jewish traditions, reading, playing the accordion and the piano for his family, playing games and sports with his children, and taking his family on hiking trips, camping trips and other adventures.